It's a short kata, with a straight line embusen. I shouldn't have as much trouble remembering how it goes as I do. But I've got time to get the muscle memory going. I just hope I am officially taught the kata soon. That would be nice to do tonight...maybe if there isn't too much focus on tournament training. 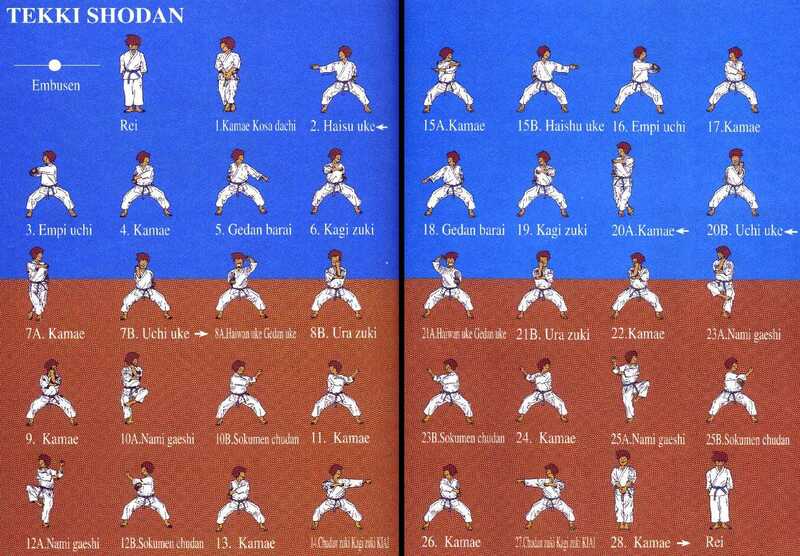 I love that kata-we call it Naihanchi Shodan in my style. I love all the naihanchi kata (shodan, nidan, and sandan) something about the stance and the fact that you only go back and forth in the same line is kind of cool-like your back is up against a wall. The simplicity of that kata is deceiving. It is one of the most complicated kata to perform correctly. Moving with side stance, and crossed stance with control, and grace takes ALOT of leg strength, and development. You will find your abdomen, and rib muscles aching from the demands of the techniques.. especially the Hook punch that demands good hip vibration to achieve. This kata is one of my favorites.